First of its kind, FMLogics™ streamlines diagnosis of the hardest cases. According to several peer-reviewed medical studies, diagnostic accuracy comes from a good patient history in nearly 80% of the time. Until now most clinicians have had to do their best with hand-written questionnaire responses, anxiously recorded by patients in the office during their scheduled appointment time. Inevitably those responses are spotty, difficult to analyze in a time crunch, and are frequently inaccurate. 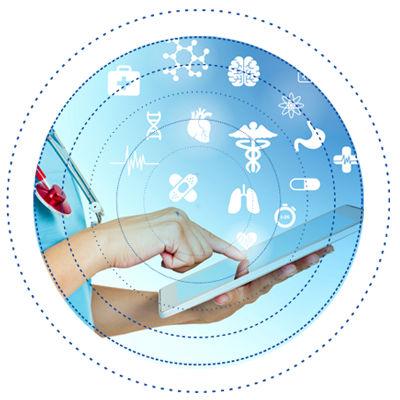 FMLogics™ provides a physician-created digital system that allows patients to complete their comprehensive medical history at home without time constraints or “white coat” pressure. Patients submit it securely back to you and FMLogics™ provides you with a Triphasic Analysis to review prior to their first appointment. Designed for integrative medical professionals treating patients with chronic health problems that are especially challenging to crystallize, the software goes far beyond simply gathering patients’ information conveniently. It also analyzes the medical history; lifestyle, diet, complaints and environmental exposure items reported by the patient and then summarizes the patient’s condition using the knowledge in cutting-edge research databases. Even before you and the patient come face to face, FMLogics™ gives you strong indicators of specific deficiencies, imbalances, illnesses and syndromes. You refine these insights via the physical exam, lab tests and further discussion with the patient. When patients can fill out their medical history questionnaire at home and you don’t have to race through it right away, they spend less time in your waiting room and more time with you, their healthcare professional. No longer do patients have to come back for a second consultation because they weren’t able to remember crucial details on the spot or were too anxious in the office to give you adequate information. No need to puzzle over bad handwriting, wait for someone who is slow with their questionnaire, or go through half-completed forms with the patient. With a pre-submitted history and FMLogics™ analysis of the patient’s answers, you end up spending more quality time on resolving each patient’s health challenges. Your office doesn’t need to mail out and monitor the receipt of completed patient history forms or juggle appointments because someone takes a very long time to fill out their form in the waiting room. You save on administrative costs because your staff doesn’t need to digitize patient information for you or file and retrieve bulky paper records for you. For many integrative medicine providers, this represents the greatest value of FMLogics™. In addition to usefully summarizing each patient’s input, the program uncovers hard-to-see patterns and interactions in the data, which is especially important when it comes to conditions like gluten sensitivity, digestive system disorders, biotoxins, food allergies and vitamin or mineral deficiencies. You see summaries of the organ systems that are likely compromised, possible toxicities, and the imbalances that your treatment must address. By by helping you identify the real causes of patients’ complex, chronic health problems.With the computer-assisted analysis built into FMLogics™, you are much more able to untangle the reasons for a patient’s multiple symptoms. The program systematically applies hundreds of research-based correlations to your patient’s data and gives you a report that would take many hours to derive on your own. Think of it as an extremely smart andtireless medical assistant with a perfect memory. Patients feel “listened to” when you care enough to gather detailed medical histories and lifestyle data. Considering that integrative medicine clinicians often treat people who have already seen many other healthcare providers, with poor results, this in itself means a lot to patients. When you combine the superior diagnostics that FMLogics™ enables, you can appreciate the accolades and referrals that it will bring. Remember, patients are more compliant when they feel their practitioner has finally gotten to the root of their health challenges. he cost of the software is negligible when you take into account how it will enable you to effortlessly see more patients each week, do a better job of helping them recover their health and see your practice grow as a result. Moreover, you don’t need to take our word for that, as you can try out FMLogics™ with no long-term commitment. Save trees and have less paper to shred or recycle. Take pride in having a greener healthcare practice. It’s fully HIPAA-compliant. Patients are explicitly reassured about the privacy and security of their data before they enter their personal information. If you’re an MD, DC, ND, OD, Acupuncturist, Doctor of Oriental Medicine, Homeopathic Physician, Dietician, Physician Assistant, Nurse Practitioner or other integrative medicine practitioner, FMLogics™ is designed for you. The program is web-based, with nothing to download. Either by you or by patients. Questionnaires can be completed and reports read on any desktop computer, tablet, laptop or smartphone. You can add your own notes to your patient’s history after it is submitted to you. FMLogics™ gives you a bloodwork Interpretation program with multiple result comparison report and Advanced FM test. You have the option to show a patient portions of the FMLogics™ analysis that you feel explain the patient’s symptoms. You may cancel your subscription to the program at any time, with no further monthly payments required. Patient files are retained indefinitely in FMLogics™. If you need to temporarily suspend or cancel your subscription, your patient files will still be available when you return. You may download or print patient files at any time that your subscription is active. If you have questions, we’d love to provide answers. But if you like the idea of alleviating patients’ suffering faster and increasing the efficiency and profitability of your practice, sign up today for FMLogics™.